Aseptic meningitis is characterized by noninfective serous inflammation of the meninges. It can occur in a recurrent fashion when associated with dermoid and epidermoid cysts due to rupture of cyst contents into subarachnoid space resulting in aseptic chemical meningitis. Bacterial meningitis in association with these tumors is commonly related to a coexisting dermal sinus tract and the most common organism is Staphylococcus aureus. 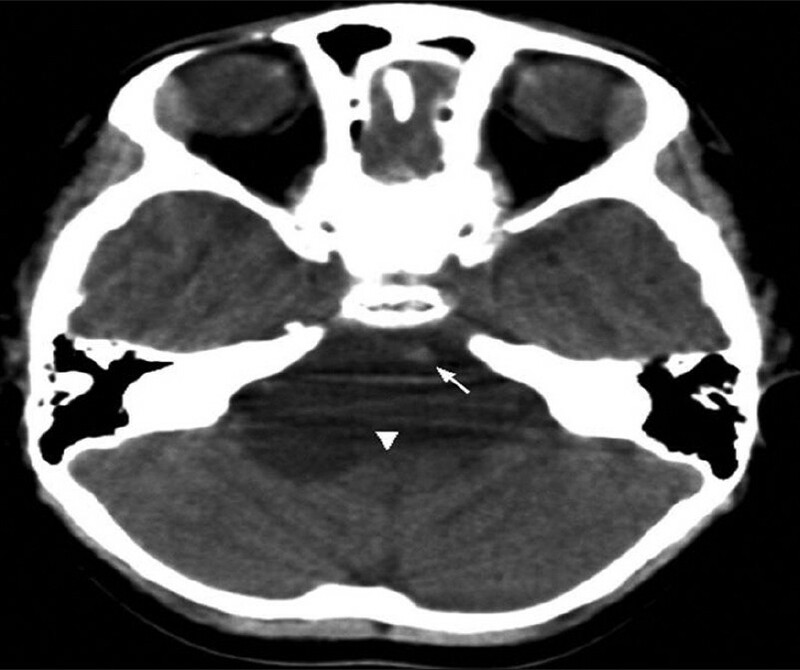 A 4-year-old female child presented with her third episode of fever, headache, and vomiting. Her first such episode was at 3 years and 2 months of age for which she was treated elsewhere as "pyogenic meningitis" with antibiotics after a cerebrospinal fluid (CSF) study which was culture negative. She improved only to have a similar recurrence 4 months later. Since she had recurrent meningitis, computed tomography (CT) of the head with contrast was done which was initially reported as "normal." Her complement levels (C3 and C4) and immunoglobulin (including IgG subclass) assays were normal and her retroviral status and vasculitis workup were negative. She was given pneumococcal vaccine and was discharged after which her third similar episode occurred. She never had seizures, altered sensorium or trauma. Examination was normal except for terminal neck stiffness. In view of recurrent meningitis CSF leak was thought of and CT myelocisternography was done which did not reveal any bony defect. Reevaluation of the old CT showed a hypodense (2-20 Hounsfield Unit) cyst seen in front of the brain stem, with minimal flattening of the anterior surface of medulla which was initially missed [Figure 1]. Magnetic resonance imaging (MRI) with spectroscopy confirmed the presence of an epidermoid cyst in the premedullary cistern [Figure 2] with a prominent lipid peak. She underwent a near-total excision of the lesion and histopathology confirmed an epidermoid cyst. The patient completed a 2-year follow-up and is event free. Recurrent meningitis is defined as two or more episodes of meningitis separated by a period of complete resolution of signs, symptoms, and laboratory findings. Aseptic meningitis can be recurrent and is characterized by noninfective serous inflammation of the meninges. It presents as recurring bouts of fever, meningism, pleocytosis, and a failure to culture organisms from the CSF. The illness is usually mild and runs its course without treatment. The reaction is sudden and striking but of short duration, and is often preceded and followed by symptom free intervals. The literature search identified 24 cases of recurrent meningitis associated with dermoid and epidermoid cysts. Histologically, only one tumor was determined to be an epidermoid cyst. Our case was unique because of its relatively early and rare presentation with aseptic meningitis and to highlight the fact that these lesions can be missed in cursory CT reading unless specifically looked for. Identification of these lesions is important since patients can be spared expensive workup for recurrent meningitis and they can lead a symptom-free life once total excision is performed. 1. Kriss TC, Kriss VM, Warf BC. Recurrent meningitis: The search for the dermoid or epidermoid tumor. Pediatr Infect Dis J 1995;14:697-700. 2. Schwartz JF, Balentine JD. Recurrent meningitis due to an intracranial epidermoid. Neurology 1978;28:124-9. 3. Davis KR, Roberson GH, Taveras JM. Diagnosis of epidermoid tumor by computed tomography. Radiology 1976;119:347-51. 4. Forgacs P, Geyer CA, Freidberg SR. Characterization of chemical meningitis after neurological surgery. Clin Infect Dis 2001;32:179-85. 5. Tekkok IH, Baeesa SS, Higgins MJ, Ventureyra EC. Abscedation of posterior fossa dermoid cysts. Childs Nerv Syst 1996;12:318-22. 6. Tebruegge M, Curtis N. Epidemiology, etiology, pathogenesis, and diagnosis of recurrent bacterial meningitis. Clin Microbiol Rev 2008;21:519-37. 7. 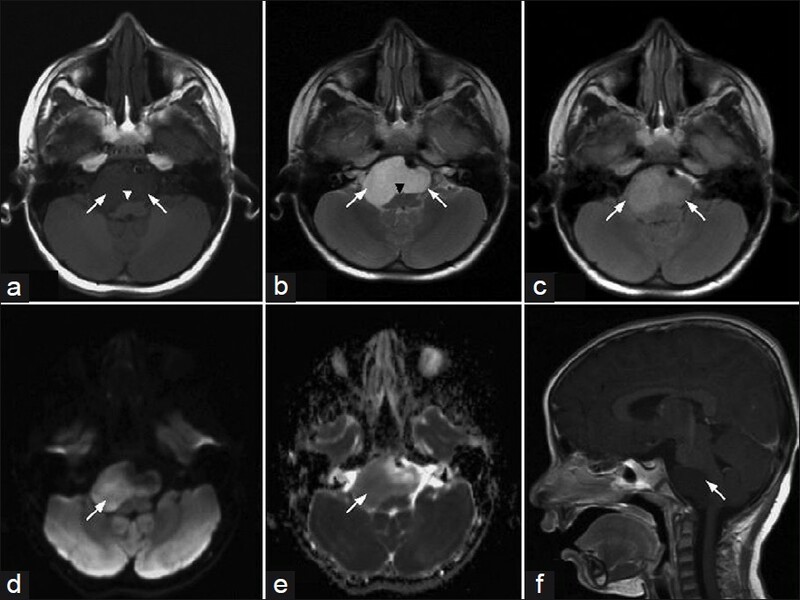 Ceccarelli M, Balestri M, Fontani C, Lupetti L, Ughi C. Recurrent meningitis: A case report. Eur J Pediatr 1989;148:646-7.